Oil delivered to LOOP is temporarily stored in the LOOP crude oil storage facilities in Clovelly, Louisiana - the largest privately-owned crude oil storage facilities in the nation. LOOP operates eight underground caverns that have a total storage capacity of approximately 60 million barrels (9.54 million m3). The man-made LOOP storage caverns are cylindrically-shaped, vertical spaces that were hollowed out from a vast underground salt formation. While salt dome storage is not an unfamiliar technology, the LOOP Clovelly Salt Dome facility is the only repository in the world continuously receiving and distributing crude oil. 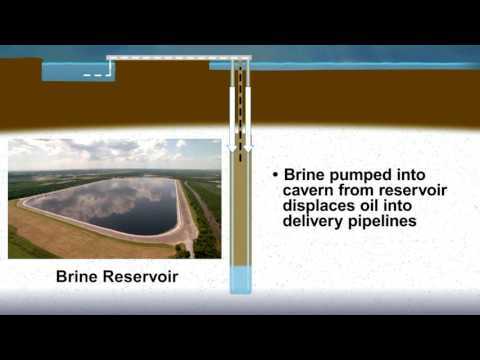 Oil is pumped into the caverns where it displaces brine, which is sent to an above ground brine storage reservoir and eventually reused in the storage and distribution process. When brine is pumped into the caverns, it displaces the crude oil into one of four delivery pipelines. Because brine is heavier than crude oil, the oil sits atop the brine and no mixing occurs. The caverns are always full of brine and/or crude oil. The large capacity of the caverns allows customers to offload large volumes of crude oil at one time and make deliveries to refineries in batch sizes that meet their specific needs, freeing up valuable storage capacity at their refineries.